“It’s SoCirC’s 5th birthday and we are having a Carnival to celebrate! This event is also a fundraiser for our community programs which provide social support, inclusion, community and creative expression through circus arts for young people 16-29 living on the margins. Over the past year our community group has worked together learning to express, have fun, fail, succeed and to build trust & self-esteem. We will share a piece of this experience with you through our youth show “The Carnival of Life”! This is a CARNIVAL, so come in your favourite carney outfit and/or dress as YOU, however that looks. Don’t miss this evening of carnival games, carnival food (popcorn, pogos, cotton candy, pizza…) , live music, fortune tellers, drinks (lemonade, beer, wine), a silent auction with exciting prizes, “The Carnival of Life” youth show followed by some of Toronto (and Winnipeg’s) best professional circus artists performing aerial silks, clown, drag, contortion, fire eating, staff and spinning hoops throughout the evening. Come celebrate with us! Kids are welcome. Packages including carnival tickets are also available. This event will be ASL interpreted by Toronto Sign Language Interpreter Services. Parking is available on site. Leave yourself time to find it as it can be a little tricky. It is in the building just north of where the Banksy exhibit was, around the back and says “raw space’ on the front. We want you to come support our youth, enjoy and celebrate with us, so if fees are a barrier to your attendance please contact us directly and we can do our best to accommodate in advance as we have a few donated tickets to extend! Please get in touch with any accessibility needs. Contact us directly : info[at]socirc.ca . We are a charitable organization. Any package purchased for $20 or more, we will offer you a tax deductible receipt. 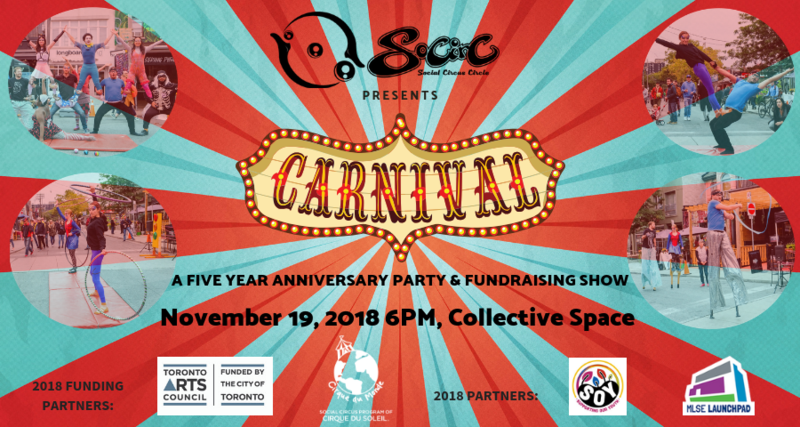 All proceeds for this event will go to SoCirC to provide accessible social circus programming for Toronto young people living on the margins.